Present state: The station (Grade II listed) is now the headquarters of the South Tynedale Railway. (Narrow gauge) The station building and platform have been preserved in excellent condition. The goods shed (Grade II listed) now house 'The Hub' museum. Part of the goods dock has been preserved. A siding from the goods yard ran through a tunnel under Hexham Road to serve a stone yard and gas works. The tunnel has been converted into a workshop with access from the goods yard although it is now out of use. On the far side of Hexham Road only the tunnel parapet is visible. Date of visit: March 1968, January 1973, April 1976, April 1978, May 1988 & June 2010. Notes: Alston station was 13 miles 12ch from Haltwhistle. The layout comprised a single 106yd passenger platform east of the running line, a carriage siding to the west, and several sidings either side of the platform. Unusually the southern end of the platform had steps, rather than a ramp. At the terminus a turntable was provided, but was disused by 1951.The station building (Grade II listed) is an imposing Tudoresque structure of the East Coast main line type, with random stone courses instead of the more urbane ashlar, mullioned windows, moulded door and window hoods, ball finials, and lofty coupled chimney stacks. Unfortunately its appearance was marred by the rendering of three sides. In 1904-5 a single-storey extension was added. with a glazed section, offering more protection against the elements for the passengers. 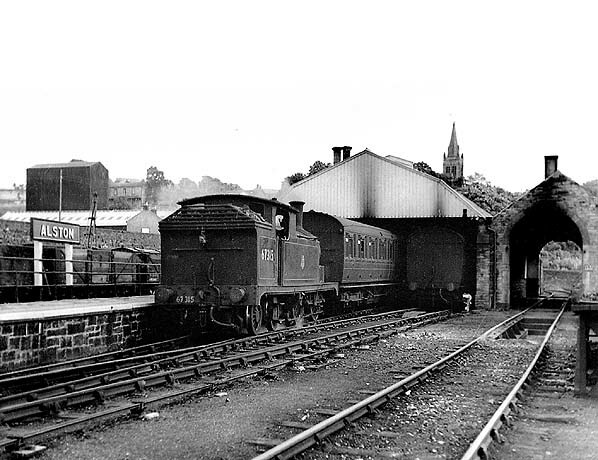 The engine shed was closed on 27th September 1959 and was demolished when the trainshed was dismantled in the mid-1960s. Goods installations were extensive, including a three-ton crane and facilities for handling livestock, furniture, coal, lime, and ore. Private sidings served Alston Quarry (to the north of the station), Alston Limeworks and a gas works, one of the sidings running through a tunnel under Hexham Road. The goods shed dating from 1852 (also Grade II) survives. 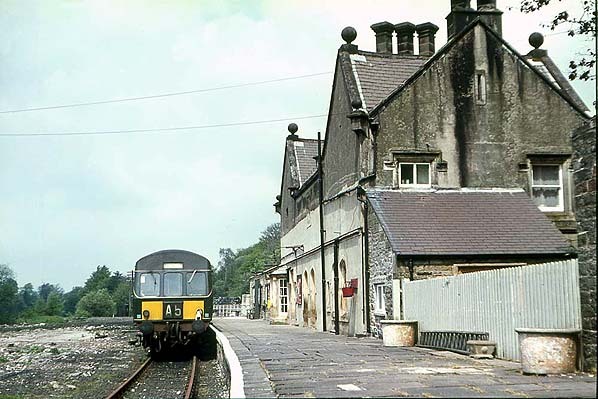 Goods services ceased on 6th September 1965 and the station was unstaffed from 6th January 1969. Although removal of the trainshed and sidings left the station somewhat bleak, it retained some delightful fixtures at closure: the LNER nameboard, gas lamps, and an original North Eastern Railway enamel Way Out sign. After closure the site, stripped of its tracks, was forlorn, but restoration of the building and the introduction of narrow-gauge trains have revitalised Alston station. It is a delightful place to visit! 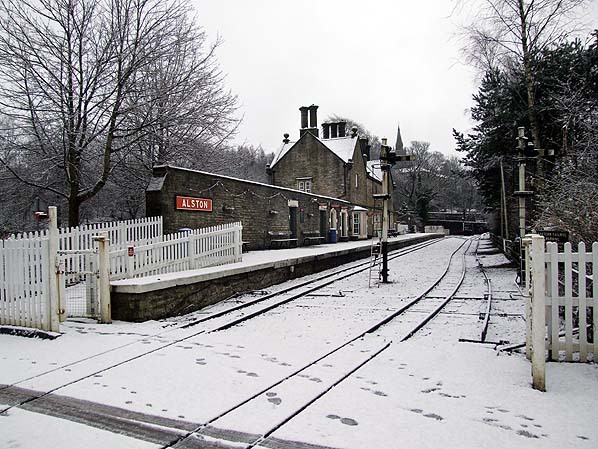 Haltwhistle-Alston was the last surviving passenger branch line in rural North East England. Its longevity reflected the inadequacy of local roads in winter weather, rather than economic health: ‘the creaking gate hangs longest’ aptly describes a line that lasted until 1976. Alston, 1000 ft above sea level, claims to be England’s highest market town. Since at least the fifteenth century, lead had been mined, and by 1768, 119 mines operated in Alston parish. Isolation from markets was a handicap. Although it was not the first proposal for a branch to Alston, the Newcastle & Carlisle Railway’s Haltwhistle-Alston-Nenthead branch received the Royal Assent on 26 August 1846. National economic problems delayed construction. When building began, the five-mile section beyond Alston was not proceeded with. The junction at Haltwhistle was adjusted to face Carlisle (the county town of Cumberland, in which Alston was situated) rather than Newcastle. An addition to the original plans was a branch from Lambley to meet the Brampton Railway at Halton Lea Gate. The revised plans received the Royal Assent on 13 July 1849. II*) is particularly striking, but others at Burnstones, Knar Burn and Gilderdale Burn, and the ‘Alston Arches over the Tyne at Haltwhistle (each Grade II) are also worthy of note. The gradient was almost continually uphill from Haltwhistle, including 1 in 70 for 1½ miles between Plenmeller and Featherstone Park; and 1 in 56, the steepest stretch, for a mile near Barhaugh, between Slaggyford and Alston. A mile-long cutting was needed between Haltwhistle and Featherstone Park. Construction began in 1850 from both ends. In March 1851 Haltwhistle-Shaft Hill (Coanwood) opened for goods, and passengers in the following July. In January 1852 Alston-Lambley and the Brampton Railway opened for goods only. When the magnificent Lambley Viaduct was complete (standing 110 ft above the River South Tyne) passenger and goods services began in began in November 1852. Intermediate stations were Featherstone, Shaft Hill (closed 1853-62), Lambley, and Slaggyford. No sooner had the branch been completed that lead mining began a rapid and continuous decline. Depopulation accompanied this recession; the population in Alston, Garrigill, and Nenthead peaked at 6,815 in 1851 and fell almost continuously to only 1,909 in 1971. Some cheer was brought by limited development of coal and zinc mining. In the late 1850s two weekday return passenger trains called at all stations. By 1863 there were three. Trains took a leisurely 40 minutes in each direction. The 1910 service increased to four, with an extra Saturday evening return trip, and a five-minute faster journey. 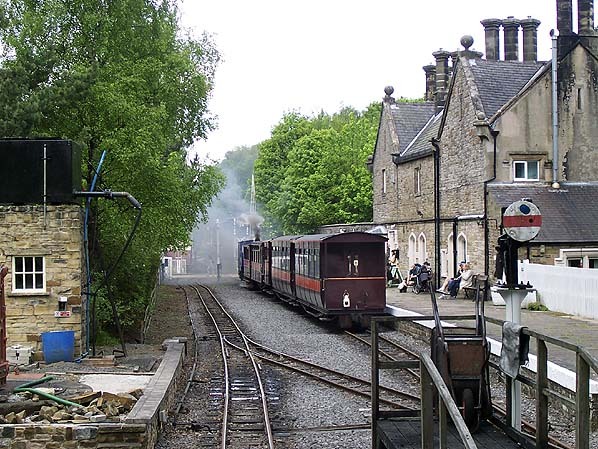 Whilst Alston’s ‘twin’ branch to Allendale closed to passengers in 1930, Alston still had its 1910 frequency. In summer 1946 Alston enjoyed eight weekday return trains, the first departure at 5.41 am, but by summer 1954 there were seven on Saturdays and only five on weekdays. Since the early days, the first advertised service of the day left Alston, where the branch locomotive was stabled. This practice continued until November 1959 when a 6:30 am departure from Haltwhistle was introduced, running non-stop (another novelty!) to Alston in thirty minutes, to form the 7:05 am departure (all stops) to Haltwhistle. 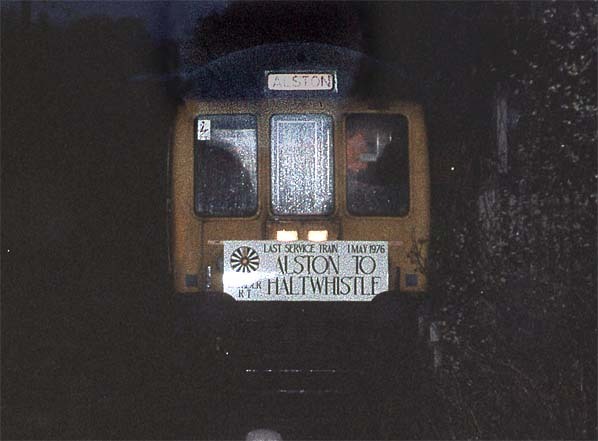 British Rail censuses in 1970 found no passengers using the first Haltwhistle-Alston train of the day. By its final timetable there were six weekday and seven Saturday returns, taking 34 minutes from Haltwhistle to Alston, and 32 back to Haltwhistle. The advertised passenger train service concealed interesting eccentricities. Plenmeller Halt, near Haltwhistle, at first served a colliery, then a Ministry of Supplies depot and finally a factory. Although omitted from public timetables, it possessed a platform for part of its life. Elsewhere unscheduled stops enabled passengers to join and leave trains. Trains regularly stopped at Park Village and occasionally at Burnstones and at various other points, including locations close to Softley and Whitwham; there were no platforms at these stopping places. With equal informality, if no one wished to join or alight, trains sometimes coasted through the stations, even when booked to call! 1900 there were two, one for passenger and the other for goods trains. Two elliptical-roof bogie coaches carried passengers in the early 20th Century, with a spare stabled at Alston. In the LNER period G5 0-4-4 and A8 4-6-2 tanks operated the passenger trains. Goods were hauled by J21 and J39 tender engines. 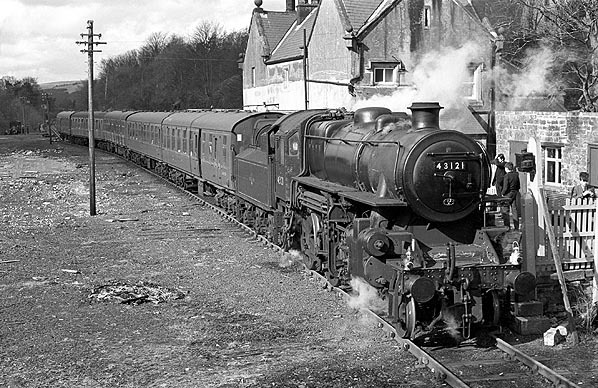 The 1950s saw a variety of steam locomotives on the branch including ex-LMS 4MT 2-6-0 and 3MT 2-6-0’s. Passenger services were progressively taken over by dmus (generally Metro-Cammell Class 101) from autumn 1959, which operated until closure. However, German 56-seat railbuses were trialled on the branch in 1965. They gave a rough ride and were mechanically unreliable. Consequently they were not adopted, although they worked some East Anglian branches. The Alston Branch outlived many lines whose passenger carrying potential was greater. Blyth and Ashington, towns of some 30,000 people, lost their service in 1964; Featherstone Park, serving several hundred, survived until 1976. As a cost-cutting measure Featherstone Park and Slaggyford became unstaffed in 1954, and Coanwood in 1955. The first serious threat of closure to the branch was in 1959, but the NE Transport Users’ Consultative Committee reported that road services could not adequately replace trains, and closure was rejected. Severe weather in early 1963 disrupted road transport, yet trains continued between Haltwhistle and Alston, providing a ‘life-line’ for remote communities. Beeching (March 1963) noted that closure of the branch was already under consideration, but that summer Ernest Marples, Minister of Transport, announced that the service would continue; the sole criterion was hardship that closure would cause. Further economies were made. Alston’s trainshed was dismantled. Lambley, and Alston became unstaffed in 1966 and 1969 respectively. Goods services ceased in 1965, and in 1966 the ‘one engine in steam’ system began, allowing Coanwood, Lambley, and Alston signal boxes to close. Crossing gates at Featherstone Park and Coanwood were removed, trains giving way to road traffic. Most signals were dismantled, although some fixed distant semaphores were retained, set at caution; one was south of Featherstone Park. At Alston, for some time, a run-round facility remained. November 1970 BR again proposed closure. 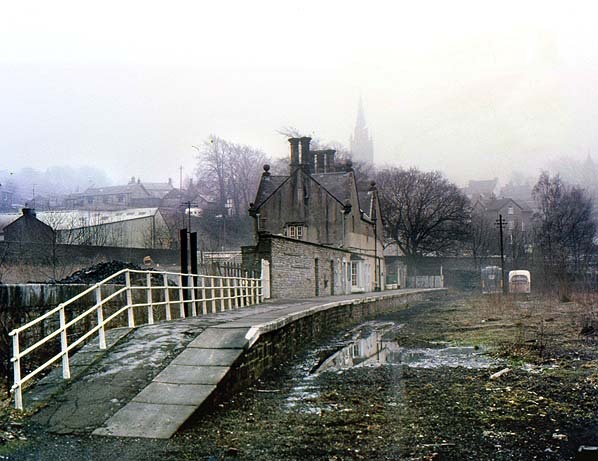 Following TUCC deliberations, in January 1973 it was announced that services would be withdrawn, subject to an improved Haltwhistle-Alston road link. Earnings of the line were quoted at £4,000 per annum; the subsidy had risen to £77,000. A one-off expenditure of £300,000 to construct an all-weather road was considered prudent use of public money. Lord Ridley, Chairman of Northumberland County Council, offered a suggestion that might save the railway. Funds earmarked for road improvements could be used to purchase the Alston Branch from BR, and the line leased to the South Tynedale Railway Preservation Society. Sadly the government was not impressed, and closure took place in May 1976, when the new road was ready. In its last months Alston was, belatedly, publicised by British Rail, who extolled the charms of the line, and offered trips by scheduled services from London. A ‘circular’ bargain-fare was available from King’s Cross and Euston, via Carlisle or Newcastle, to Alston. On the last day of service, Saturday 1 May 1976, some 5,000 passengers travelled on scheduled services on the branch, with yet more on special trains. The final train left Alston at 21:09 to the accompaniment of a lament played by two pipers, and the thunder of detonators. On 3 May 1976 rail services officially ended. In January 1977 South Tynedale communities were isolated; roads were blocked by snow. This time the railway could not come to the rescue. The STRPS was committed to keeping the line in operation, but could not afford the purchase price of £160,000 asked by British Rail. BR would not permit the society operate trains on the branch to help raise money to buy the line. Track dismantling began in winter 1976-77. In March 1977 STRPS had the option to buy the last 1½ miles of track, from Gilderdale to Alston, for £40,800. Once again the price proved too high. Demolition continued, and all rails were lifted by June 1977.
line was extended 1½ miles to Gilderdale Halt in 1986; a Light Railway Order was obtained in October 1987 for this section. A further ¼ mile to Kirkhaugh Halt opened in 1999. The South Tynedale Railway intends to reach Slaggyford, having obtained planning permission for this project in 1986, and ultimately Haltwhistle. Reinstatement of the branch has been aided by the English Tourist Board, the local authorities, and the Manpower Services Commission. Today the South Tyne Way footpath and cycleway follows the course of the Alston branch for much of its length. In November 2009 a grant of £100,000 was awarded by Groundwork UK Community Spaces programme which will be used to fund the restoration of three historic bridges on the Alston line. Northumberland County Council’s west area committee also granted consent for a completely new station at Lintley which is scheduled to open in 2011. STRPS now have a lease for the trackbed from Kirkhaugh to Slaggyford, including the station building at Slaggyford where some remedial work has started to ensure no further deterioration of the listed station building. A further extension of the line from Lintley to Slaggyford is planned to open in 2015.
station buildings at Featherstone Park, Lambley and Slaggyford, are described by Bill Fawcett as ‘economical and picturesque’ symmetrical two-storey houses distinguished by a steeply gabled projecting centre. (Coanwood’s station house was a later structure.) All were built of local stone. Until closure the rural charm of the stations was enhanced by their retention of elderly oil lanterns (with gas lighting at Alston). Whilst Alston retained its sturdy LNER wooden nameboard, still painted in BR(NE) tangerine, with raised white-painted metal letters, the other stations were (regrettably!) fitted with black-and-white ‘Corporate Identity’ nameboards following the line’s reprieve in 1963; these replaced wooden nameboards painted in a dark version of BR(NE) tangerine, the letters outlined but not in-filled – and almost illegible. In 1962-3 the name of Coanwood station was not displayed anywhere along the platform. Eastern Region handbill of 1967. At Featherstone Park a near the entrance informed passengers that the station was an Unstaffed Halt, and the implications for ticket purchase. The other stations possibly carried such signs too. Tickets exist for each of the intermediate stations using Halt in their name. Further reading: Eastern Main Lines - Hexham to Carlisle including the Alston and Brampton Branches by Roger Darsley. (Pub: Middleton Press 2006). See also South Tynedale Railway web site. Copyright photo from John Alsop collection. 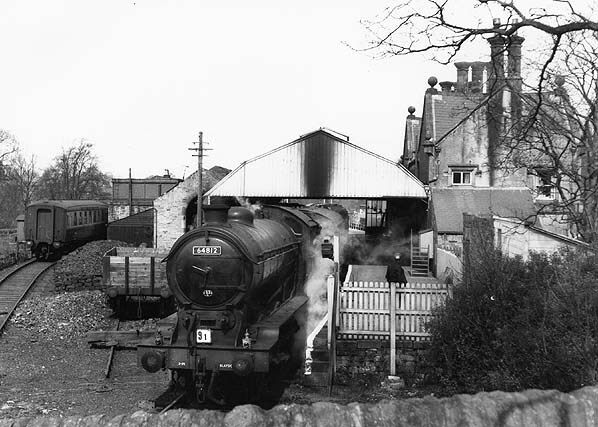 Alston station in the 1950s. The loco is a Gresley J39 class from Blaydon shed. Built 1929 at Darlington and scrapped in 1963 also at Darlington. It is working a class 1 express working, maybe a railtour looking at the headcode. Alston station in the c. early 1950s. The locomotive is NER G5 class 0-4-4-tank, designed by Wilso Worsdell and built in 1900 and was withdrawn in 1958. Shedded at 52C, Blaydon from 1948 until 1955 when it was transferred to 56A, Sunderland South Dock until withdrawn in 1958. 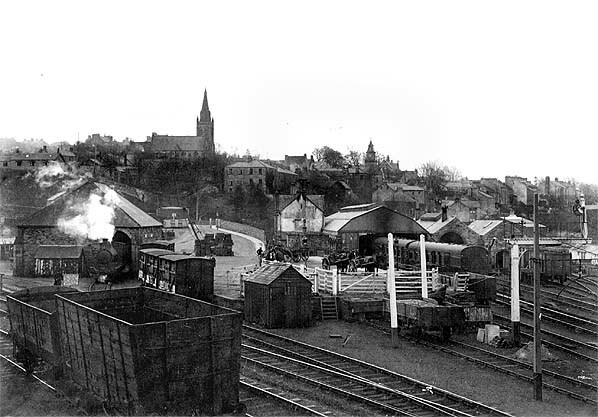 Alston engine shed is seen on the right. this remained in use until 27th September 1959. Scottish Rambler No.6 railtour on 26th March 1967. The loco is an Ivatt designed class 4MT No 43121. Built in june 1954 at Swindon, an LMS design in GWR territory, shedded first at 14A, Cricklewood lasting to almost the end of steam being withdrawn from Carlisle Kingmoor, 68A on 18/11/67. It was finally cut up in November 1968 at Motherwell Machinery, Note by this date the trainshed and engine shed had been demolished and the sidings lifted. 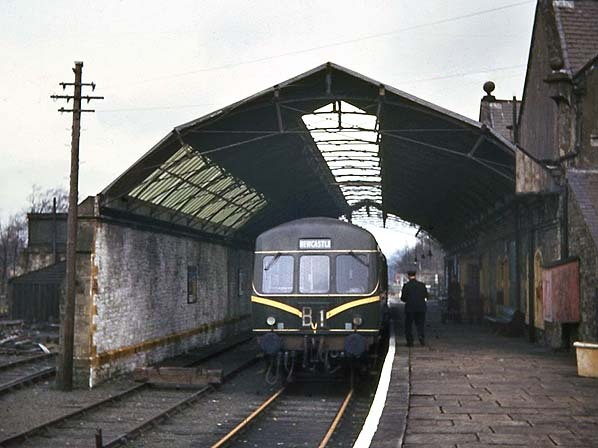 A Haltwhistle DMU waiting at Alston station in March 1967. 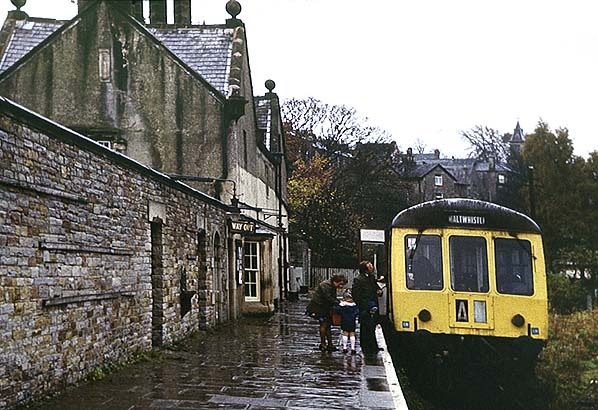 Alston station in Spring 1976, a few weeks before closure. 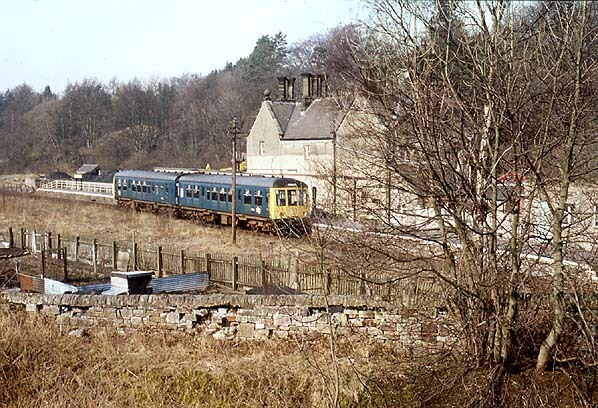 The last train at Alston on 1st May 1976. 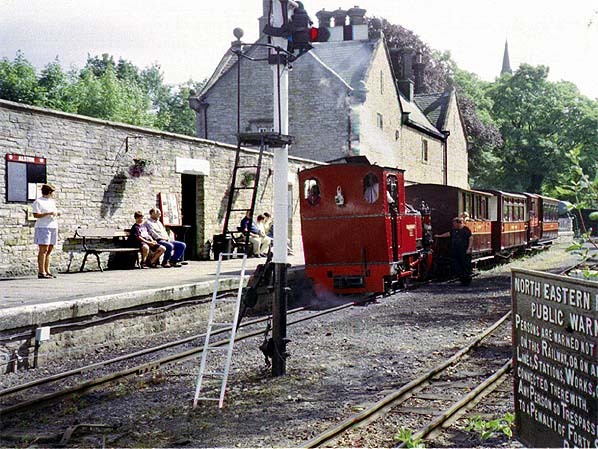 By 1998 the South Tynedale Railway was well established at Alston. Helen Kathryn prepares to take a passenger train to Gilderdale, the northern terminus at that time. of the line in June 2010. 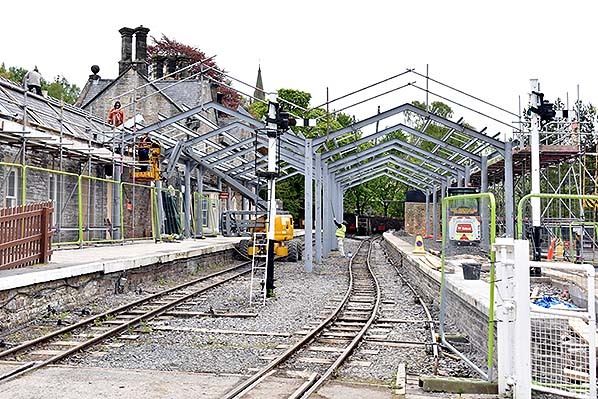 Changes are underway at Alston station in May 2017. These include an enlarged visitor attraction, new toilets, new café, second platform and a new train shed roof. The work for completion in early summer 2017. The second platform is on the site of the old engine shed.